This weeks Monday Motivational Poster on Growth Mindset is about asking for help. Sometimes it takes more courage to ask for help than to act alone. Let’s face it, life can be challenging. 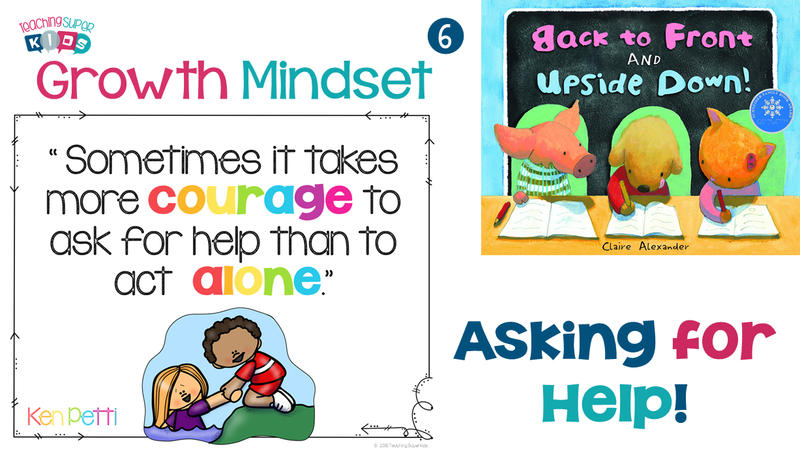 Learning to ask for help is an incredibly important life skill! Seems obvious, right? The book I am suggestion fits in perfectly with the discussion on asking for help. Click on the image to view the book trailer. Get the book and read it aloud! Seriously, I am sure that you will have at least one or two students in your class right now that will relate. Then use some of the strategies below to begin the discussion with your classroom today! Brainstorm ways that people ask for help. Share examples of the different types of people who might ask for help. It is important to let them know that people who ask for help are not dumb. But instead they are viewed as smart for getting clarification. Help your students identify areas that they need help in and then establish a system in which they can ask for help. It can be an “ask 3 before me” type of situation or something similar that you set up. By setting up a system for your students you are encouraging them that it is okay to need help and to ask for it. This is the most important one in my opinion, help students understand that by asking for help doesn’t make them “stupid”. Begin by asking them questions about the assignment or task. “What do you see?”, “What do you think you might do in this area?” These types of questions allow you to help them to see where they may just need clarification or confirmation vs help understanding the task. A child may know but lack the confidence and conviction to see it through. When in doubt, the child will get stuck. These questions can be a great place of encouragement. It is important to determined what they know about the task in front of them. That is the starting point. If they don’t know how to complete any portion of the task this is where you can tell them how proud you are that they asked for help. Look for signs of those students who seem to have a certain behavior during the day. Does Sara get distracted during math and start distracting those at her table? Your student may be asking for help by behaving negatively when they are unsure of what to do. Look for patterns in their behavior. I hope you enjoyed this week’s Growth Mindset Poster on Asking for Help! Click on the image below to download your classroom poster!